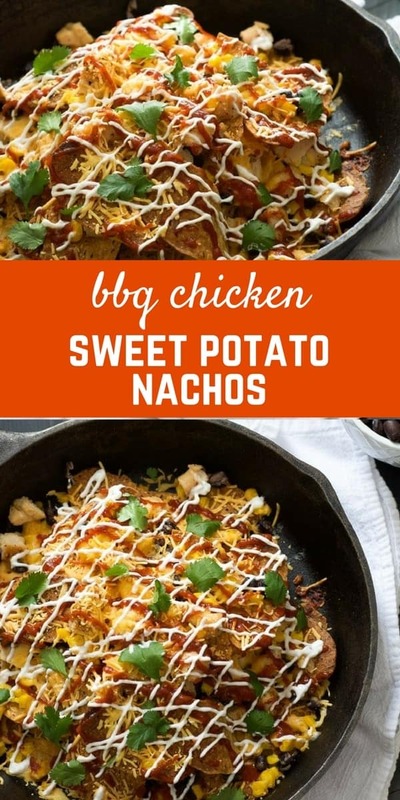 BBQ Chicken Sweet Potato Nachos are the best of both worlds – sweet and savory plus a bit of spice! They come together in a flash so they are the perfect quick dinner or snack. When dinner rolls around, there is a constant battle between my husband and I. Not about who should cook dinner (I wish that was an issue). Most of the time who is going to do the dishes isn’t an issue either. Luckily, my mister graciously volunteers! Smart man. The battle of what cuisine will reign supreme is a constant in our house. With my extreme love of all things Mexican and my husband’s love affair with BBQ, dinner can get dangerous. It typically results in one person bowing down, weeping and craving their beloved cuisine for yet another day. That was, until we experienced the best nachos in all of Kansas City. This seems like a pretty high award to give out, but nachos can actually be pretty easy to mess up. A number of things can go wrong: too much cheese results in soggy, lifeless chips. Flavorless meat leaves you wanting more. An off-balanced ratio of toppings to chips – both of which are pretty awful. Or just plain ol’ mediocre with nothing standing out. Then burnt end nachos from Kansas City entered our life and our nacho obsession has been sky high. The tender, BBQ doused pork is piled atop crispy corn tortilla chips with copious amounts of tomatoes and white cheddar. While they may not be overloaded with a never-ending list of toppings, the ratio is spot on. Each chip is accompanied with a bit of cheese and saucy pork. These nachos got my wheels turning. BBQ + Nachos = Match made in heaven! Our dinner woes would be forever solved thanks to these BBQ Chicken Sweet Potato Nachos. 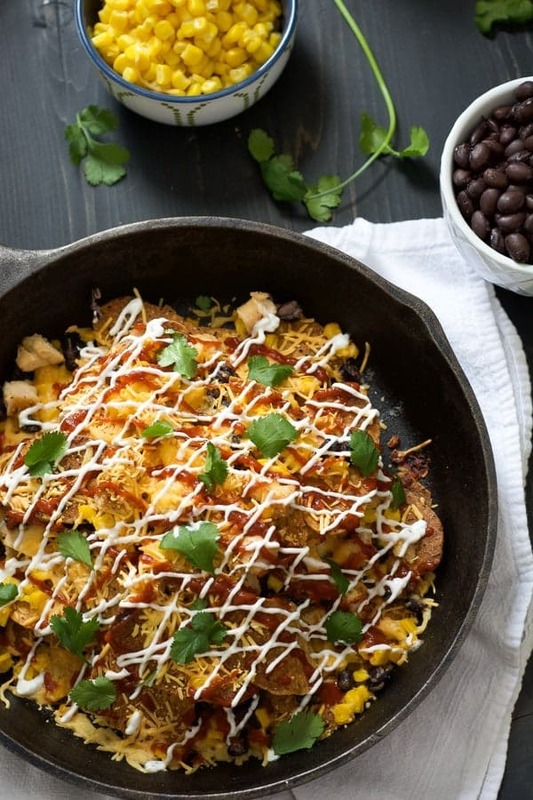 These nachos come together in under 30 minutes as they utilize already cooked chicken. You can go with rotisserie here, which would add an amazing smoky flavor, or you can do what I do and cook up a bunch of chicken breasts early in the week to utilize for lunches and quick dinners! That one step can change our dinner to home cooked rather than takeout very quickly. My original thought was to use my microwave chile spiced sweet potato chips (which were inspired by Rachel’s microwave sweet potato chips! ), but they got too crunchy in the oven as they baked even further. Not tasty. So we went with our favorite sweet potato chips from the store. In all reality, it’s a time saver! They stay perfectly crispy and crunchy. 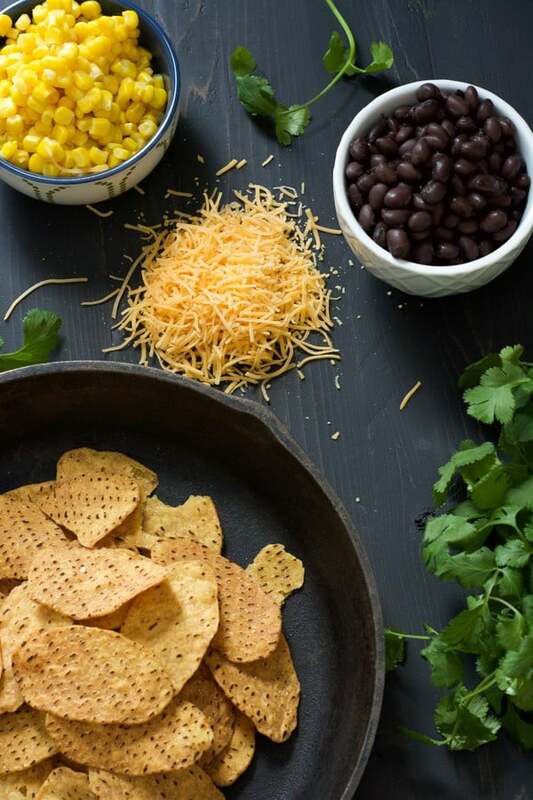 Layer the chips with chopped chicken, crisp corn and black beans. Then add freshly grated cheese. The key to perfectly melty cheese is freshly grating it! No pre-grated cheeses as they have a starch tossed with them to prevent them for caking up on you. It takes only a few extra minutes to grate your cheese yourself and the flavor and cheesiness you get is totally worth it. 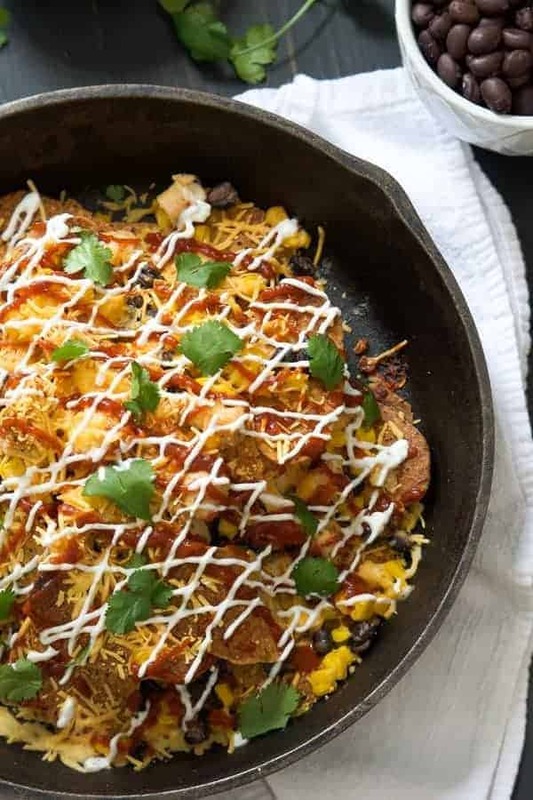 With a heavy hand of cheese sprinkled on top, the nachos go in for a quick bake, coming out in a heated, cheesy beautiful mess. Drizzle on your favorite BBQ sauce and a touch of greek yogurt and you are ready for a dinner that pleases BBQ and Mexican lovers alike! 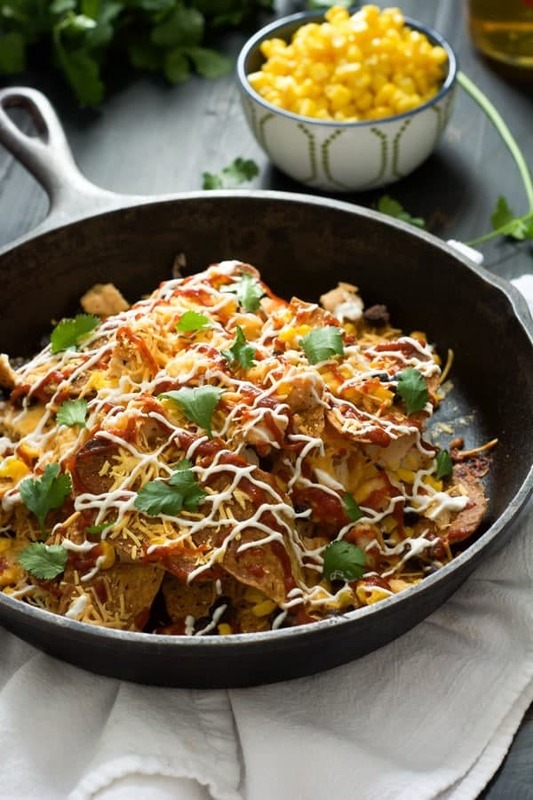 BBQ Chicken Sweet Potato Nachos are the best of both worlds – sweet and savory plus a bit of spice! They come together in a flash so they are the perfect quick dinner or snack! 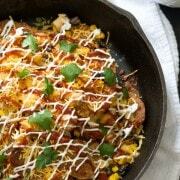 Layer 1/2 of the sweet potato chips on a baking sheet or cast iron skillet. Sprinkle with half of the chicken, corn, black beans and cheese. Add the remaining sweet potato chips, corn, black beans and cheese. Place in the oven on the lower rack for 15 – 20 minutes or until cheese is melted. 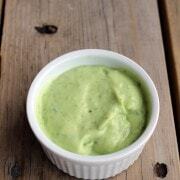 Drizzle with the BBQ sauce, greek yogurt and garnish with the cilantro. 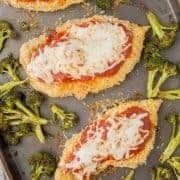 If you’re looking for more delicious chicken recipes — make sure to check out Rachel Cooks No More Boring Boneless Skinless Chicken Breast Recipes board on Pinterest! 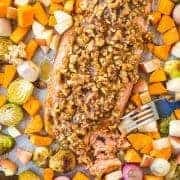 Follow Rachel Cooks | Rachel Gurk’s board No More Boring Boneless Skinless Chicken Breasts on Pinterest. Wow this looks good! I too am deeply in love with all things mexican and this looks so interesting, I would have never thought to put bbq and mexican together! I love a good plate of nachos. The sweet potato chips in this are such a great idea. Drooling! Nachos for dinner sounds good to me! These babies look awesome! Love this recipe! I love the addition of sweet potatoes to just about any dish!